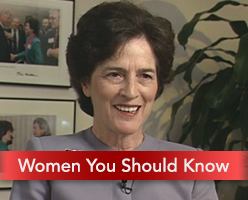 In this activity, students will explore the life of US Congresswoman and civil rights activist Elizabeth Holtzman, who helped expel Nazi war criminals from the United States during her time in the House of Representatives. Students will identify content-specific words and reflect on their significance to the text, their peers and to themselves. The final product is a Word Cloud. Each activity in the "Women You Should Know" Information Quest series focuses on a single testimony from IWitness. The series is intended to highlight several women from our collection who have each had a significant impact on the world.